Wooden pallets “move the world” and are a critical element of product packaging and logistics. Pallets facilitate material movement and efficient supply chain and logistics operations. We manufacture, refurbish and recycle a wide variety of pallet sizes and styles. We specialize in custom pallets designed for your specific unit load size, handling environment, and shipping requirements. Any size, any quantity. There are two principal pallet styles (stringer and block) and they can be designed with a variety of deckboard configurations — tops and bottoms, number, width, overhang and spacing. In addition, plywood or oriented strand board (OSB) can be used as deck material (otherwise known as a "panel deck" pallet). The grade and amount of wood, the design, and the quantity produced are the major determinants of cost. A stringer pallet uses "runners” or “stringers," to support the unit load. The stringers are the boards, typically 2 x 4's or 3 x 4's, sandwiched between the top and bottom deck boards. When specifying a stringer pallet, the length (i.e. the length of the stringer) is noted first, and the width, or length of the deckboards is noted second. Stringers may be notched to allow for partial four-way fork entry, thus creating a "4-way" stringer pallet. If the stringers are not notched, it is called a "2-way" pallet, with fork entry only from either end. Block pallets are true 4-way entry pallets. They use blocks of solid wood, plywood, or plastic to support the unit load. Between the blocks and the deckboards are thin stringers, which form a mat with the deckboard. 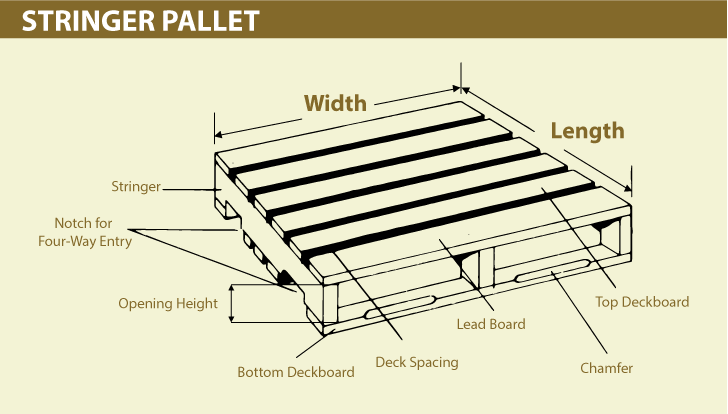 The length of a block pallet, is specified by the length of the stringer board and the width by the length of the deckboards. 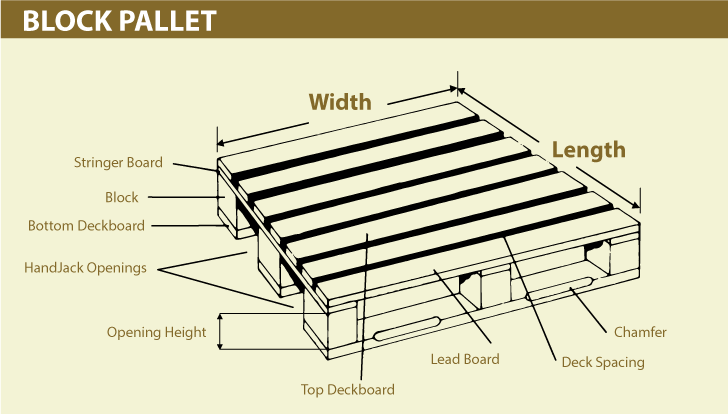 Block pallets can be designed with or without bottom deckboards, or a full-perimeter base. If you have special shipping or phytosanitary needs, we can help you with plastic pallets, 100% plywood pallets, or custom slipsheets or warehouse pallets to meet your needs.